This weekend I went down to Cayucos for an ASCA herding trial. Its about 4 1/4 hours south of me. Tsuki was in ballistic mode both days. So we didn't complete the course either day. The interesting part is that on Sunday's run I got 96 points out of a possible 120, without getting as far as the first panel. I'll get to that in a moment. In ASCA at each level it takes 2 qualifying scores to title (Started, Open and Advanced). After qualifying for a title you can stay in Started or Open for sixty days and still compete for prizes, placememts and points. After that you can run only "For Exhibit Only" (FEO) in which you can get a score but no placement or prizes. We managed 5 qualifying scores in Started before our 60 days ran out. There are good reasons someone would want to run FEO, but they didn't apply to us. So I moved him up to Open. Which we are NOT ready for. Saturday's run started out nicely enough. It was the A course which starts with the dog taking the sheep out of a pen. Light sheep (and these were) will sometimes literally climb the walls if the dog comes in. 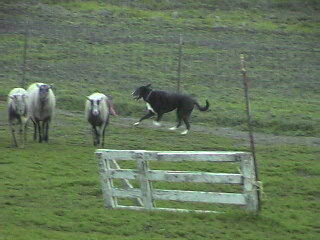 You lose points, but sometimes its good strategy to leave the dog outside and go in the pen and push the sheep out. Tsuki's had both good experiences (they came out nicely) and bad (popcorn sheep bouncing off the walls). So I left him outside, opened the gate wide and the sheep came bolting out. Tsuki waited, the sheep settled and we started off down the line. Well the sheep were flighty which makes Tsuki pushy and pretty soon we were in, push-chase-stop mode. This was not good. So finally I decided that I didn't want to reinforce the behavior. I was calling our run (quitting). The funny part was that when I called him back to me we were at the far end of the arena from the sheep. The judge said that he wasn't going to let me send my dog from there and if I did he was going to ask me to retire. I laughed and said that retiring was the plan. So we left. Our score up to that point wasn't horrible, I just didn't want to allow Tsuki to behave that way. After Saturday's run I got a little more information on running "Novice". Sounds kind of like Started, doesn't it? Nope - it is the handler that is judged, not the dog. So if you haven't put an open title on a dog you can run in Novice. It is competitive, but not titling/qualifying. It is the same course as Open, but no handler's line, and in this case the sheep were ewes they were using for Started instead of the lambs they were using for Open and Advanced. That sounded more our speed so I got us switched from Open to Novice. Our run started out roughly and didn't get much better. It was a take pen. On Saturday the sheep came out on their own. This morning they stayed there. So I got Tsuki moving nice and slow, edged him around the inside and ..... yee haw! the sheep came blasting out, Tsuki hot on their heels. While I'm trying to get my dog back under control I left the gate wide open. The sheep tried to go back in, I blocked them. Then Tsuki decided to "help" and when I went to block HIM I lost THEM back into the pen. Grrr So I got everyone settled, eased Tsuki into the pen and this time managed to have him actually stand and hold the sheep while I closed the gate. I decided to make it a fetch instead of drive. I left Tsuki standing walked out in front of the sheep and walked Tsuki up. So far so good. Until the sheep indicated they wanted to leave. Tsuki came blasting in. I flanked him around, got him stopped. And we proceeded down the fence line in that manner. I got about to the midline when I decided I had had enough. I didn't want to fight my dog around the course. So I called our run, shooed the sheep back to the repen, and left. Oh, so I guess we did get as far as the first panel. That's where I called it (retired, or quit). General practice is they hand out score sheets and ribbons at the end (at least at this trial). But the judge from the AM run was leaving before the PM trial began (family obligations). Many of us assumed that because the judge was leaving they would have him do ribbons and placements before the PM trial. Well they not only had another 10 started runs to do, but also an "afternoon trial" with both ducks and sheep. But we hadn't entered early enough so we didn't get into those runs. So I asked the course director if they were planning on having the judge hand out the score sheets. She said no, I had to wait until the end. And I said I didn't really see the point in waiting for a zero score sheet if the judge wasn't going to be there to make comments. Often they do, and sometimes its helpful. Anyway she finally agreed to get me my score sheet. And when I saw the 96 on it I said it must be mistaken. But yes not only was that Tsuki's number but there was his name and there had only been two Novice runs. So she very patiently explained that it is the HANDLER that is judged and you don't have to do all of the course to get a score. I must say that someone came up with a really cool idea when they came up with that one. Talk about positive reinforcement! And its a totally fair scoring. Tsuki was about half under control. Thankfully he doesn't want to hurt the sheep. He just doesn't want to work them at a distance. And when he gets too close they run. And he likes that because then he can run after them and bring them back. So sometimes he likes to make them run. Whata toad. My goal is to not let him get that opportunity, not let that behavior be reinforced. One exercise I've been working on is having him drive the sheep around the arena. He is on a long line so I can keep him back. The idea is to get the sheep entirely around the arena without them ever running.I guess I'll have to work on that some more. For the time being Novice is going to be our class. As a course its between Started and Open. We don't :"need" qualifying scores. We do need to practice in lots of different places. And me getting judged on handling is not such a bad thing. This picture isn't from the trial. I just wanted a place to put it.